During an interview on Wednesday with CNN’s Anderson Cooper, Republican Presidential candidate Donald Trump was asked to comment further on his response to a question at last Saturday’s Iowa Family Leadership Summit regarding whether or not he has ever asked God to forgive him. As previously reported, Trump had been asked by moderator Frank Luntz during the Q&A segment of the event whether he has ever sought forgiveness for his sins. “But have you ever asked God for forgiveness?” Luntz repeated, evoking laughter from the audience. He said that he does take communion, and opined that perhaps it is a form of seeking forgiveness. He said he doesn’t really think about needing to ask God to forgive him. On Wednesday, CNN’s Anderson Cooper mentioned Trump’s response, stating that it had surprised some hearers. 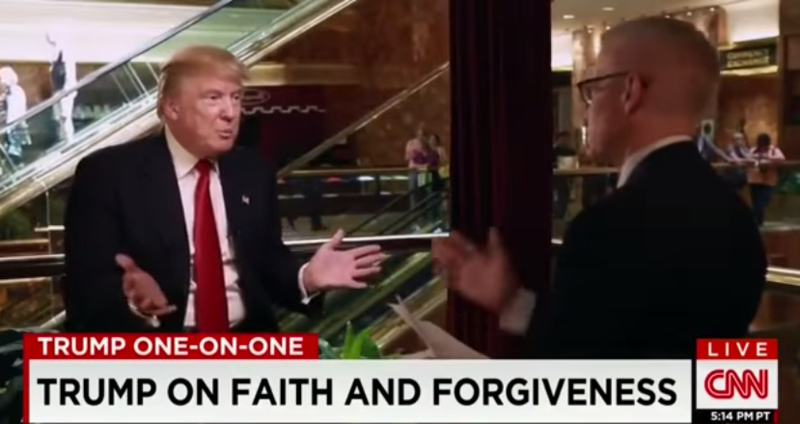 “I go to communion, and that’s asking for forgiveness in my opinion,” Trump responded. “The idea of asking [for] forgiveness, is that a central tenant for you?” Cooper asked. Cooper then asked Trump if repentance is a subject that is important to him. “I think repenting is terrific. I mean, it’s great,” Trump replied. “But do you feel the need to?” Cooper inquired. “You give millions to charity,” Cooper chimed in. “I built the Vietnam memorial in lower Manhattan with a small group of people,” Trump exclaimed. Following Trump’s initial comments on Saturday, Shane Vander Hart of Caffeinated Thoughts published an open letter to Trump to share the gospel with him and explain the reason why every man needs forgiveness. Vander Hart then urged Trump to confess his sins to God as every man is required to do. “The Bible tells us, ‘If we confess our sins, He is faithful and just to forgive us our sins and to cleanse us from all unrighteousness,” (1 John 1:9). He wants us to ask. As we confess our sin we need to repent, that just means to turn around, turn around from your sin and turn to Jesus,” he said.